Increasingly few of us are confined to the same location for work any more. That’s the beauty (and curse) of Wi-Fi and cell coverage. It might seem like all you need for a portable office setup is a laptop but there’s more to it than that: here are our favorite essentials. We’ve looked back over some of our favorite devices and gadgets for making your portable office run at its most efficiently, then highlighted the pick of the bunch. You won’t be short of great options here. Read on to find out more about creating a great portable office setup for your business or side hustle. Oftentimes, you’ll find yourself needing to work out of your car. Obviously, not while driving, it’s useful to be able to prop up your laptop and other documents and get to work easily. 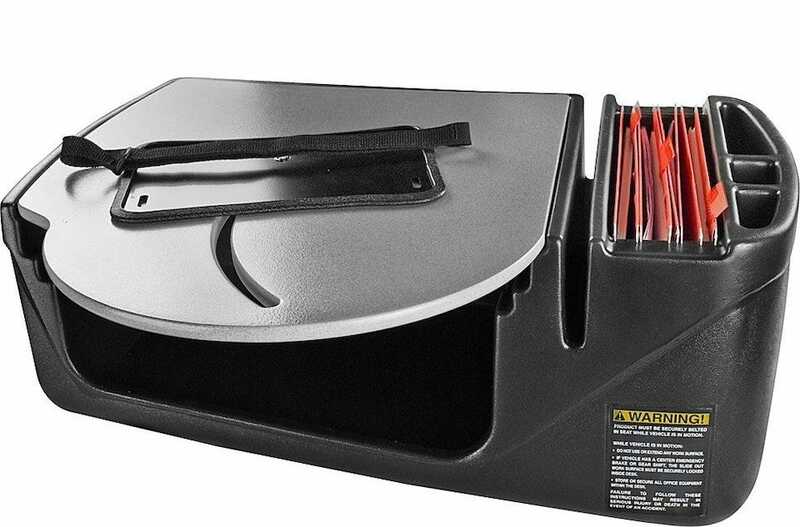 The AutoExec RoadMaster Car Desk is the best option out there thanks to its extensive file storage, hidden storage compartment and a dependable surface for writing or typing on. It easily fits on the passenger side of your vehicle, transforming that space into a portable office for your working needs. 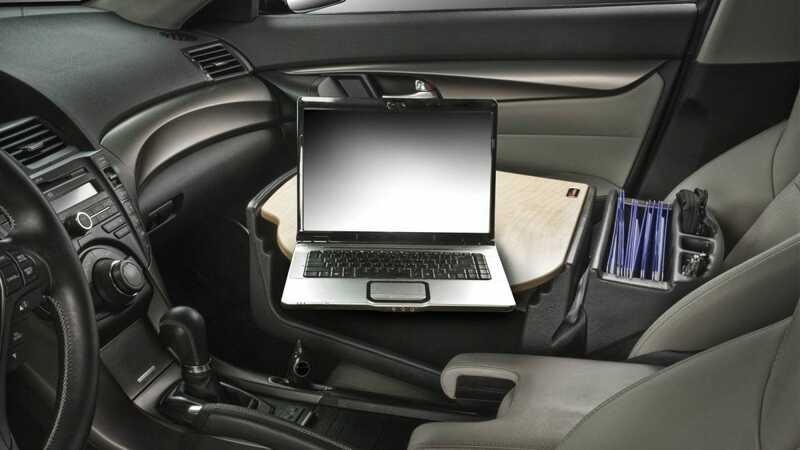 It’s not cheap though, so we’ve also looked at the best car desks for any budget. Without power, you won’t get far with most of your work. Buy the Anker PowerCore Speed 20100 and you won’t have to worry about tracking down power outlets in coffee shops or other venues. It utilizes both USB-C and USB-A so there’s no device it won’t charge. It has a capacity of 20100 mAh so, for a frame of reference, it’s able to charge an iPhone 8 6 times, an iPad Air 2 almost twice, and a MacBook once. That should be more than enough power for your charging needs but if you feel like you need something a little different then check out our more involved look at the best portable chargers currently out there. A travel router typically offers all the functionality of a regular home or office router or wireless access point, but with the flexibility of you being able to take it with you on your travels. It’s not a perfect solution but it goes a long way to solving your portable networking issues. 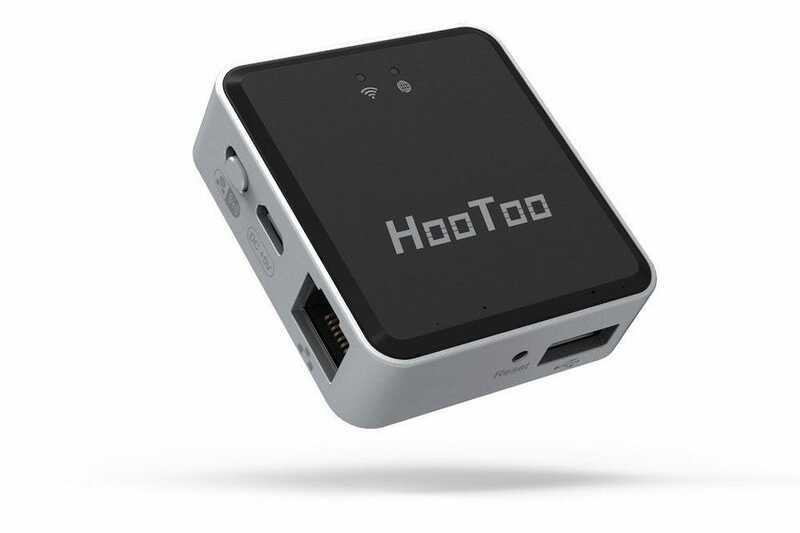 The HooToo Wireless Travel Router is our pick of the bunch. It’s inexpensive and easily converts a wired network to wireless, or enables you to bridge an existing wireless network. Streaming options are also there. Plus, it only weighs 1 oz and is powered by USB. It’s super portable like that. If you want more options for travel routers, check out our in-depth roundup on the subject. Being on the move means you need to pack a lot into your bag or backpack. If you have a backpack, we strongly recommend you get the Hynes Eagle Universal Backpack Insert for dividing up the main cargo space efficiently. It creates the right amount of room for a 14″ display laptop. 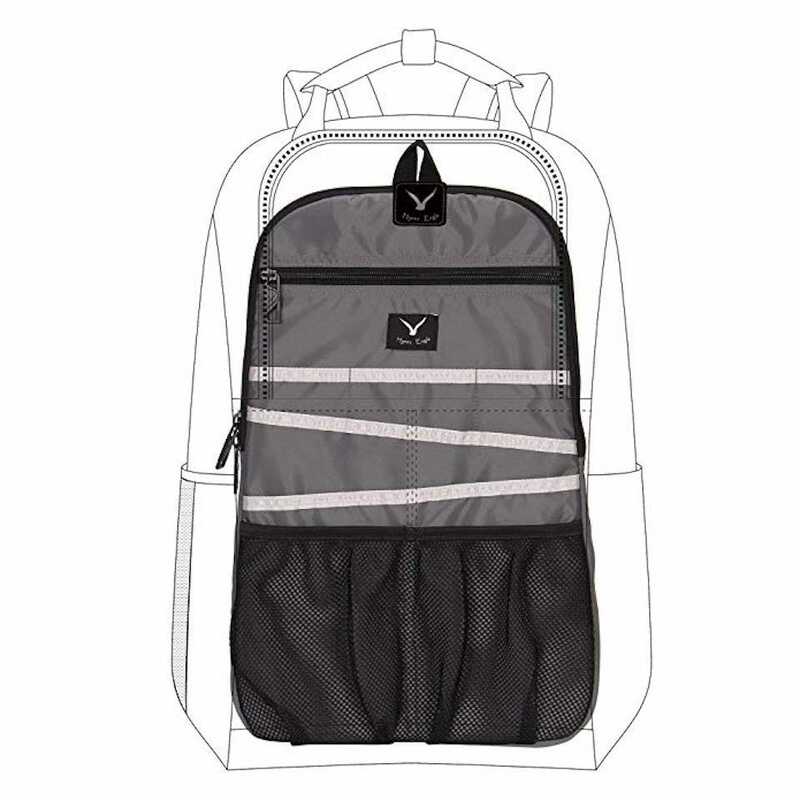 Overall, there are 15 organizational pockets including 2 folder pockets, 5 open-top pockets, 2 elastic mesh pockets, 2 large zippered pockets, 3 pen slots, and 2 key loops. That means tons of flexibility for you as you arrange what you carry. If you’re keen to look up other bag organizers, we have more in our dedicated roundup feature. 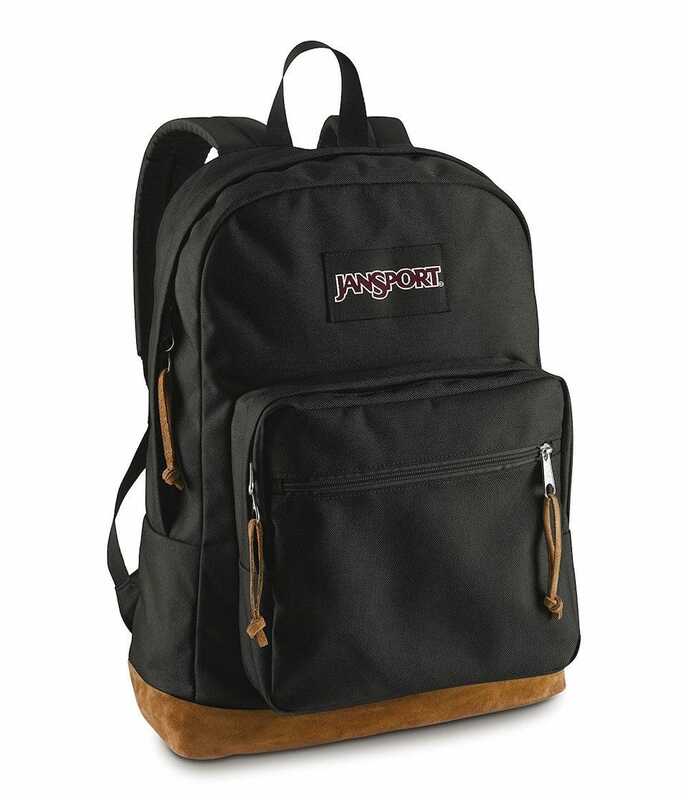 If you’ve just realized you don’t even own a backpack, then buy the JanSport Right Pack Backpack. We already checked out all the best backpacks for college students, but the JanSport one is perfect for most anyone who wants to put all their stuff on their back. The bag is available in many different colors, with a signature suede leather bottom for extra security. There’s a main compartment with a 15″ laptop sleeve along with one zippered pocket, and a front stash pocket. It’s all made from durable fabric so it’ll stand plenty of wear and tear. A lifetime guarantee can reassure you on that front too. 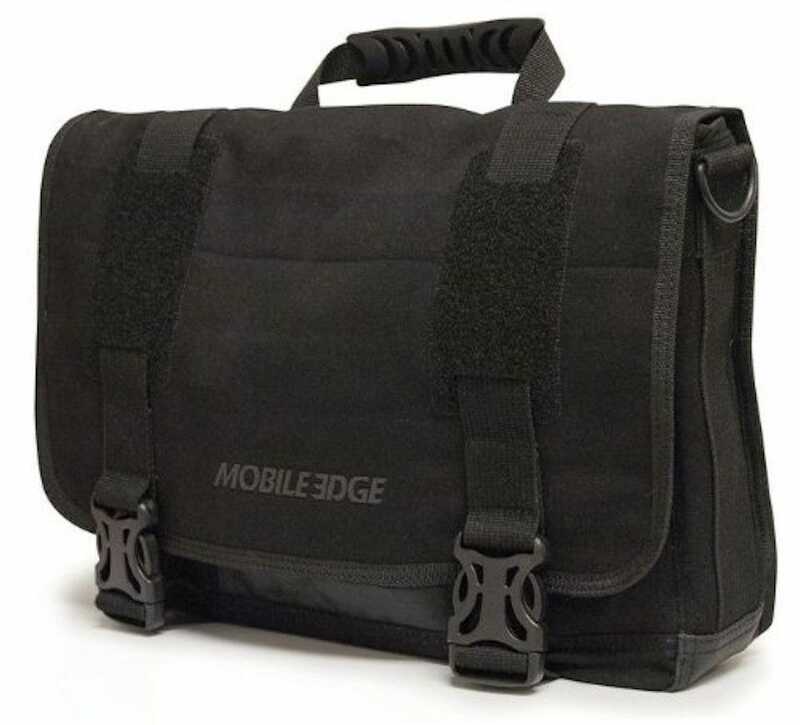 If you’d prefer to use a laptop messenger bag than a backpack then the Mobile Edge Ultrabook Messenger is for you. Again, we covered the best laptop bags for under $40 in more depth, but this is the best of the bunch. Its all natural cotton canvas exterior looks sharp. Underneath the surface is a dedicated padded laptop compartment with an extra pocket just for your tablet. It has a removable ID holder multiple anchor locations, plus there are custom molded fasteners to keep your gear secure. It looks the part while also being immensely practical. In some lines of work, it’s essential that you have a briefcase rather than a backpack or messenger bag. The Samsonite Vachetta Leather will fulfill those needs. 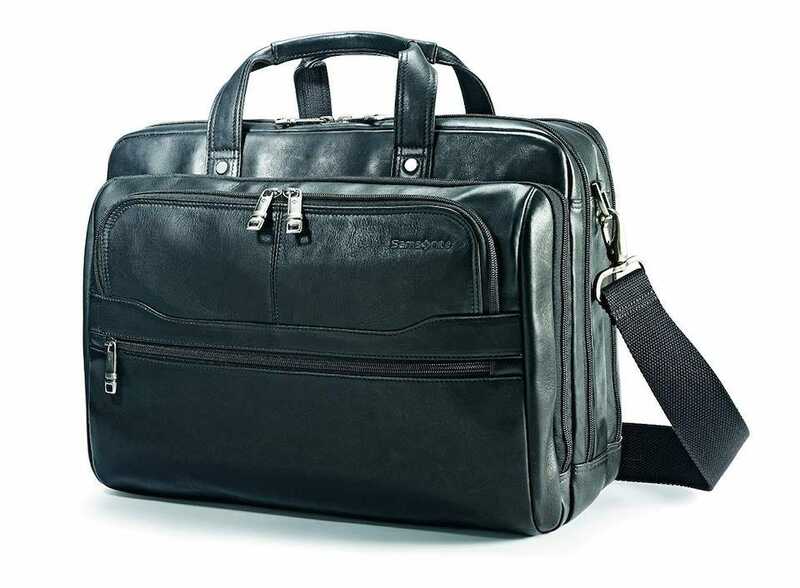 We looked at some far more expensive briefcases but the Samsonite is a good value solution. It looks the part and it has plenty of room for up to a 15.6″ laptop as well as room for your iPad or tablet. A padded, removable shoulder strap means you don’t have to hold it like a briefcase all the time either. Once upon a time, dual monitor setups were far from easy to achieve when on the move. That’s changed thanks to a plethora of USB powered monitors. 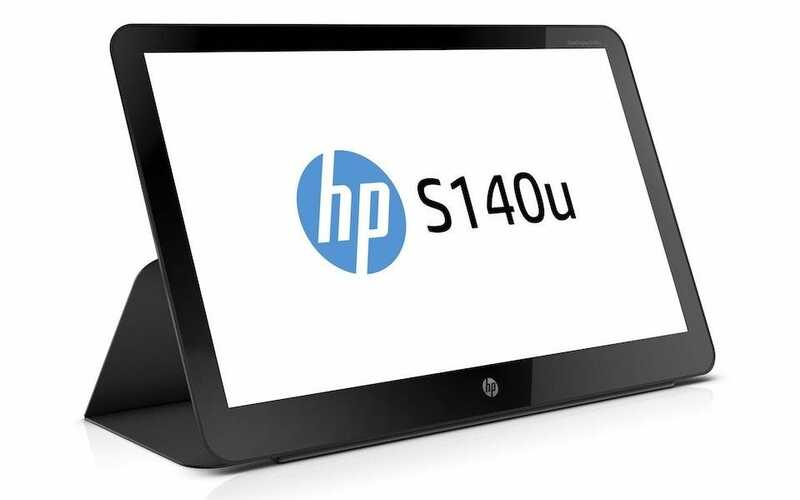 We tackled this issue in depth recently, with our favorite of the bunch, the HP EliteDisplay S140u. The monitor is the ideal combination of size, ergonomics, and features. It has an integrated tablet-style protector that folds out into a tri-fold stand so you’re never for want of a way to prop it up safely. Its 14-inch panel is only 1600×900 resolution which is a little lower than what most of us are used to on our primary monitors, but it’s still useful for a secondary screen. Even more so when you consider its reasonable price tag.